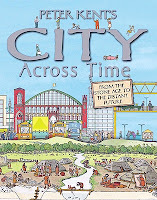 Peter Kent's City Across Time by Peter Kent. (Grades 2-6.) Kingfisher, May 2010. 48 pages. Reviewed from library copy. This title has been nominated for a Cybils Award, and this review reflects only my own opinion. What happens to the cities that have been here before us? Peter Kent gives readers a look at a European city from the Stone Age through the twentieth century (and beyond)! Detailed cut-away illustrations show layers of civilization, Romans building on top of Iron Age ruins, a medieval city popping up on top of Roman ruins, etc., with each spread giving a brief overview of the time period. This is a great choice for showing kids the progression of time and demonstrating where artifacts come from. Kent starts the book with an introduction and information about archaeologists and how they excavate ruins to find out about the people who used to live there. The illustrations and facts will encourage kids to explore this book again and again, each time finding something new. Kids will pore over the illustrations, flipping back and forth to see the progression of certain details. For example, in the 16th Century spread, a family digs a well in their basement. In the next spread, the 17th century where the village is being pillaged, we see someone hiding bags of coins in a hollowed out niche in the well. In the 18th century spread, the well's been sealed off, the coins still safely hidden. They stay hidden through the 19th and 20th centuries, until the 21st century, where we see someone's found them and is delighting in his newfound riches. There are lots of details like the coin bags and kids will delight in flipping the pages back and forth to see what happens and where certain elements appear. The book includes a glossary, an index, and a short section with further information on the different eras. Websites are provided for each time period as resources for further research. Check out another review at Sal's Fiction Addiction. 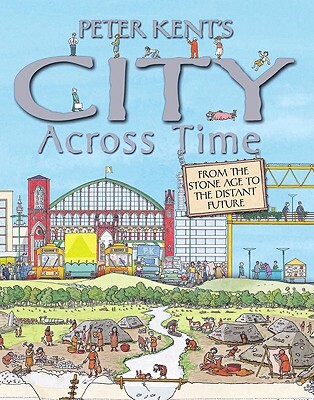 Peter Kent's City Across Time is on shelves now!